It has been proven... I get more inspired to dress up during and after my autumn trips! I love the colors associated to this season, and it's so lovely to watch people walking by the streets of Japan or Korea with well-coordinated clothes imitating the colors of trees during fall: golds and reds, oranges and browns. Everything's so breathtaking from the nature view to people's fashion sense! During my recent trip to Tokyo, I picked up a few classic autumn styles from store visits, and mostly from the stylish locals I came across during our many commutes. Plaids are classic prints, but they look especially great this season! Aside from seeing them on long sleeve polos, they are also cute on your trousers and backpacks! I love that Anello Philippines came up with a holiday collection featuring their classic backpack style but in different plaid patterns! We often see the usual red-blue and blue-green colors for this, but you can also upgrade the style by looking for other color combinations like my current favorite yellow-brown! Corduroy has always been around, but I think it's getting more attention than before! An alternative to our DENIMS, corduroy can also be a pretty thick and hot for Manila's climate. But you can still sport them here through your cap or bucket hat, your bag, skirt, or trousers! My current favorite is corduroy in brown or yellow! Autumn is all about more subdued and less bright colors, so I do away with pastels or even white for the meantime. Aside from black, my favorite muted tones are burgundy, olive, and navy blue. Just like plaid, leopard or cheetah prints are classic autumn prints that have withstood trends. They can be a bit WILD (haha) for some, but pairing this print with plain pieces makes a classier look. I love matching leopard print pieces with denims or browns (or both!). Styling game is stronger when you utilize textures on your clothing. Adding a touch of either velvet, fur, or suede on my outfit makes it more unique and even holiday ready! In Tokyo, I wore a black tracksuit which is already common, but what made this pair from Mossimo special is the material--they're black velvet! Again, it's harder to wear this in our climate, but you can still wear a touch of velvet or suede through your jacket (that you can take off outside), skirt, or bag. I can say that these styles are easily classic autumn looks that goes back on-trend again and again, year after year. I know I will wear them again next year! Just style them differently and it will look different and still look great. And since you'll be storing most of these clothes for next year, it's best to take care of these pieces so you don't have to buy again. This also goes for stuff you buy for autumn and winter trips like your coats and Heattech warmers. First tip is to make sure you have good storage spaces. Be mindful of sensitive materials like fur, suede, and most especially leather! You have to take them out of your closet from time to time and let the clothing breathe. Sometimes I even keep those small paper packs you often find in new bags, and put them in my closet. These are made to keep moulds, moist, and even odors away. And last but often taken for granted, wash your garments using the right washing machine designed to care for your clothes like Electrolux. 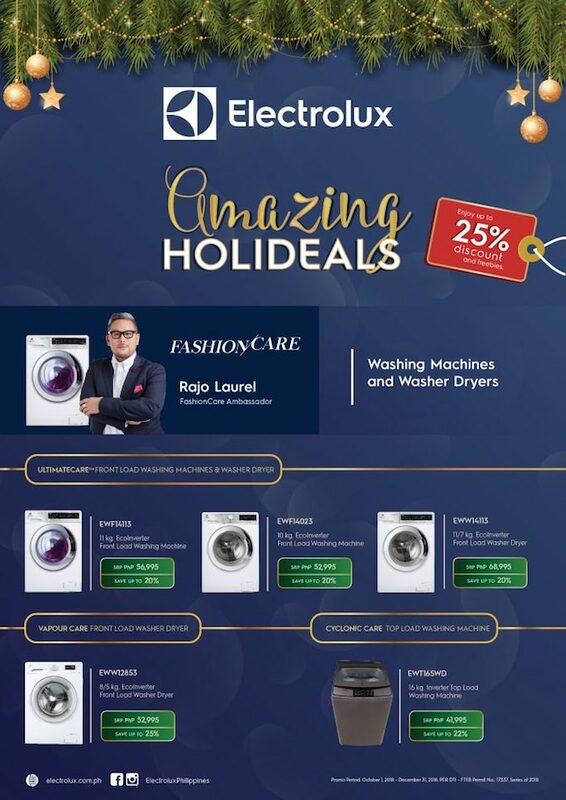 Electrolux has an UltraMix technology that keeps the softness, shape, and color of your clothing so you can wear it for years, and it will never look worn out! Best part is that Electrolux is energy efficient! By this, it reduces energy consuption by 75% while guaranteeing long lasting performance. Like the cycle of season, fashion also makes expected comebacks. Classic, as they put it. Make sure to invest on clothes that will be with you through the years, backed with proper clothing care through the right storage and technology. Share to me your favorite fashion season or autumn trends below! :) Check out the hashtags #TimelessStyle #ElectroluxFashionCare for more tips on taking care of your clothes.